A worrying report by the Centre for Literature in Primary Education (CLPE) revealed that only 4% of kids books featured a Black, Asian and Minority Ethnic (BAME) character, and only 1% featured a BAME main character. In light of this I was asked to write an opinion piece for the Independent. This is a very important issue to me and the reason I am delighted to be working with diverse publisher, Knights Of. Back when I was ten, a wonderful teacher at St Joseph’s Primary School in Newton Aycliffe inspired me to become a writer through his brilliantly creative teaching methods and encouragement. I know how hard it is for teachers to find time for this today as the formulaic nature of the SATs does not inspire, or allow, much creativity in children’s writing. I wanted to do something to encourage year 5 and 6 children the way my teacher inspired me when I was their age. So, with the help of Teesside University’s school liaisons, we devised a competition that would offer a free creative writing talk to eight schools across Teesside, along with an incentive for the children to create some really exciting pieces of creative writing. 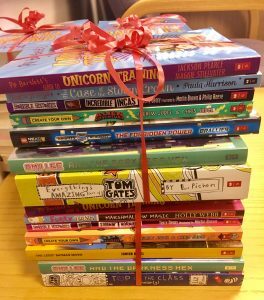 I funded £225 in National Book Tokens for the winners, and my publisher, Scholastic, kindly provided a bundle of books for the libraries of each participating school. The competition involved writing a 500 word story on any theme at all. Each of the schools received a free author visit during which I talked about idea generation exercises, story structure, and writing techniques. One of the wonderful things I realised during these visits was that, despite the restrictions placed on them by the curriculum, passionate teachers were doing their very best to inspire joyful creativity in the classrooms. The entries were fantastic! It took a while for a team of us to whittle them down to twenty four standout entries, from which a panel of four judges, including myself, chose three winners – a very difficult task! The winning entry was by Annabelle Foulds from Corporation Road Primary School in Darlington. Her story, I Didn’t Want To, made each of the judges say ‘Wow’ and take a moment to recover. It was written in the first person and portrayed the emotional struggle of a mystery character who could not stop hurting people. The narrator is finally revealed to be… well, I’ll let you discover that for yourself when you read her entry, below. Annabelle received £100 in vouchers as her prize. Annabelle with her proud mum and dad. The runners up were both from the same school, Oakdene Primary in Billingham. Enaya Ali, wrote a wonderfully rich story about a girl attending a school for children with magical skills, and Ella Ramsden submitted a dark gothic tale about a girl who drowned by moonlight. They each received £50 in tokens. Whilst at Oakdene I heard their headteacher reassuring anxious pupils about the SAT’s, explaining that they should not fret over the exams as they are not a true measure of their intelligence, creativity and individuality. No wonder there were two winning entries at that school! 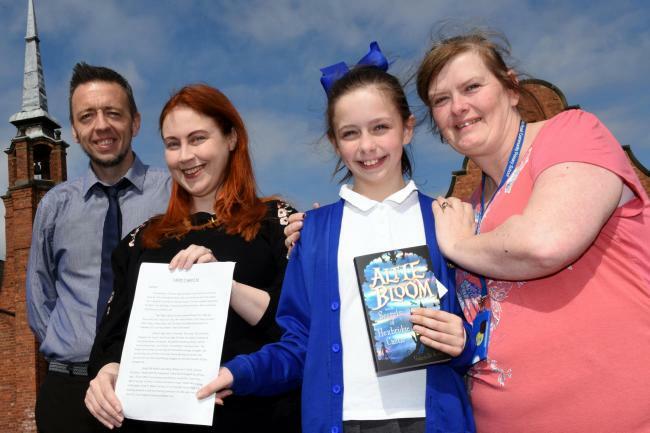 There was another story by Tom Knight of Coatham Primary in Redcar that the judges thought deserved recognition – a tale of a fighter pilot falling through strange new worlds full of bizarre creatures as he lay in a coma after a crash. Tom was awarded £25 in tokens for his creativity. Running the competition was a wonderful experience which allowed me to see the brilliant job that so many teachers are doing, as well as the depth and maturity that can be seen in the writing of so many young children. It was a pleasure to visit their worlds. Hi Kathy, I hope to write more, but am working on a couple of other series at the moment, including Knights and Bikes which is out next week. I love the Alfie bloom series my favourite is the secrets of Hexbridge castle! Thank you, Zarah! I’m so glad you like the books. The first of any series is fun as everything is new and exciting!